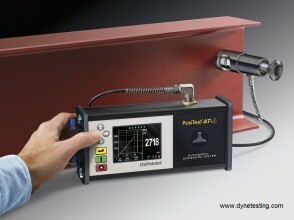 The new Automatic Pull Off Adhesion Tester now features impressive smart technology. Still simple to use, durable and versatile the ‘AT-A’ Automatic Adhesion Tester measures with ease and precision the adhesion bond strength of applied coatings to metal, wood, concrete and other rigid substrates. The adhesion bond strength is measured by the tensile pull on a dolly glued to the coating surface. The force is applied through the centre of the dolly by hydraulically loaded pin ensuring an exact central point loading of the force. 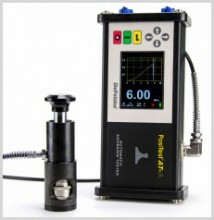 Adhesion values are recorded by a pressure gauge giving a 1:1 pressure reading. Environmentally sealed enclosure – weatherproof, dustproof & shockproof. Meets or exceeds IP65. Rubberised, shock absorbing grips to provide a stable, skid-resistant footing. Impact & scratch resistant colour touch screen with keypad for operation with or without gloves. Adhesion test with the simple push of a button. No twisting, pumping or cranking. No valves to close, needles to reset or scales to adjust. Electronically controlled hydraulic pump that automatically applies smooth and continuous pull-off pressure. Greatly reduces user effort and the risk of influencing the pulling process. Built-in rechargeable batteries perform over 200 tests per charge. Continue testing with AC power while batteries recharge. Internal memory stores maximum pull-off pressure, rate of pull, test duration, dolly size, pass/fail, the nature of fracture and user notes for 100,000 pulls in up to 1,000 batches. Calibrated and certified to +/- 1% accuracy using a NIST traceable load cell. Self-aligning aluminium dollies that enable accurate measurements on smooth or uneven surfaces. 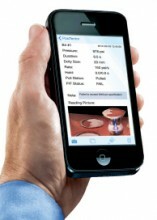 WiFi technology wirelessly communicates with PosiSoft.net and downloads software updates. This testing equipment offers effective quality control with a non-destructive capability and can be tested on both external & internal surfaces of pipes. Conforms to international standards including ISO 4624/16276-1; ASTM D4541/D7234 and others. Adhesion Tester, built-in rechargeable NiMH battery with charger, dollies, abrasive pad, cutting tool, glue with mixing sticks and palettes, cotton swabs, USB cable, PosiSoft Software, instruction booklet and video, shoulder strap, Certificate of Calibration traceable to NIST, two-year warranty, sturdy lightweight carrying case.